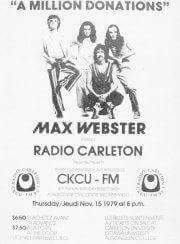 Max Webster played this benefit concert for 93.1 Radio Carleton, agreeing to donate $2000 to the struggling university radio station. DJ Mitch Beaudoin introduced to the band to the stage. Morning news casts on CKCU-FM are prepared on the back of old public service announcements. Tape is scrounged from left-overs at local recording studios. Albums are played by the crackle and pop of - what disc jockies call "the rice crispie syndrome." These are the signs of the budget squeeze faced by Carleton University's radio station. The second annual fund-raising drive for Radio Carleton begins today, with the station's future still not assured. About 40,000 listeners tune in to CKCU every week. Last year, 1,400 of these contributed $17,000 to keep the station on the air. This year, the two week campaign's goal is $22,000. It's needed to help pay operating costs and salaries to supplement the work of more, than 100 volunteers at Radio Carleton. A further $3,000 will be raised from local businesses to form a contingency fund for the station. "You can have all the volunteers must LOCAL and enthusiasm you want, but if you don't have the support staff, that energy just dissipates," station manager Craig Mackie said . last night. "What's really important is to have some continuity," he said, pointing out that staffers who train the volunteers rarely stay more than a year because they can only be paid part-time. The $125,000 annual budget of CKCU is barely half what is required, Mackie said. The station . cannot survive forever by recycling tape and salvaging equipment parts. The fund-raising drive has already attracted widespread support. Among the biggest boosters of Radio Carleton are Max Webster, one of Canada's top rock bands. Max Webster will perform a benefit concert for CKCU on Nov. 15, at the Civic Centre. The group has agreed to donate $2,000 of its contract fee to the station.